Experience more fun and excitement during your stay. 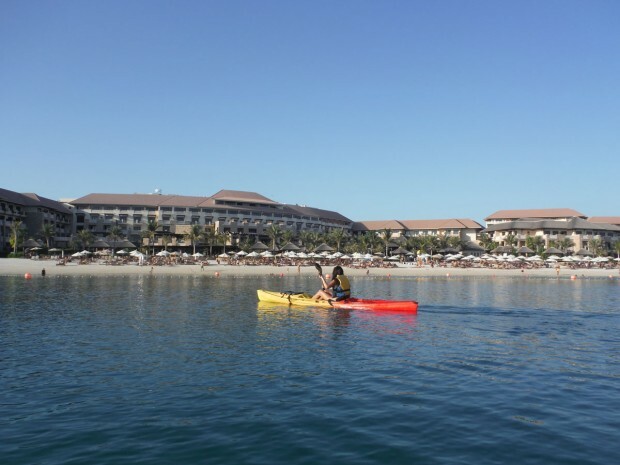 Sofitel The Palm presents a complete menu of water sports to keep you active and help you explore the sea. Rent snorkeling gear for incredible up-close views of colorful tropical fish. Hop onto a kayak, pedalo or paddleboat, and push out into calm waters to see the resort and Palm Jumeirah from a different perspective. For more thrills, reserve a Hobie Cat or windsurfing board and sail over the sea. Adrenaline seekers also have plenty of options from waterskiing and wakeboarding to extreme motorboat rides out in the open waters of the Arabian Gulf. Want a more relaxing adventure on the waters? Head to the resort’s private jetty and join a one or two-hour cruise for privileged views of Palm Jumeirah’s sights. For a truly luxurious experience, reserve a small or large boat for a private trip with extended family, friends or business associates. For bookings and more information, consult our Leisure Concierge in the main lobby or your personal butler.